Minutes after the Maine Republican threw her support to Trump's nominee, Joe Manchin of West Virginia became the only Democratic senator to back him. WASHINGTON — Sen. Susan Collins, who had been the last undecided Republican vote on Supreme Court nominee Brett Kavanaugh, announced Friday she will vote in favor of President Donald Trump's pick, virtually ensuring his confirmation when the full Senate holds its final vote on Saturday. It now appears that there will be 51 votes in favor of Kavanaugh, because Democratic Sen. Joe Manchin of West Virginia came out minutes after her speech in favor of the nominee, the only Senate Democrat to back Trump's pick. "Outstanding!" was the reaction of one White House official to Collins' speech, and White House press secretary Sarah Sanders weighed in on Twitter. 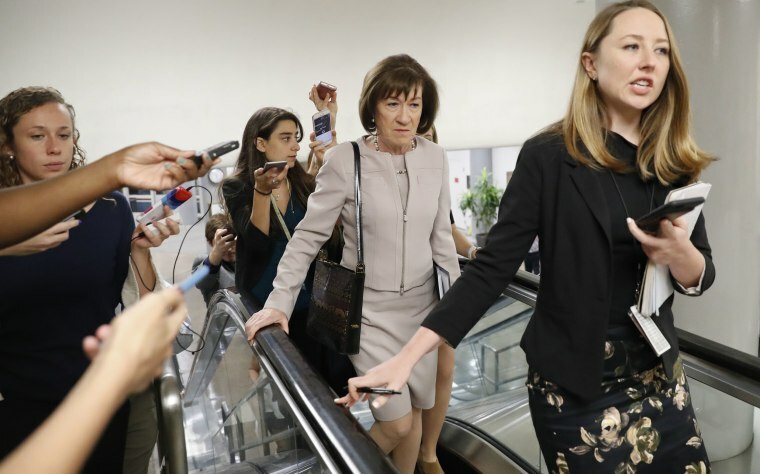 In her remarks, Collins said "fairness" dictates that claims of sexual assault "should at least meet a threshold of 'more likely than not,'" but that the facts presented in the allegations made by Dr. Christine Blasey Ford "lead me to conclude that the allegations fail to meet the 'more likely than not' standard." Collins also praised Kavanaugh accuser Ford for her courage and the senator said she believed her when she testified she was sexually assaulted, but she added that she was troubled by the lack of corroborating witnesses for Ford's claim. She said she disagreed with those saying that "unless Judge Kavanaugh's nomination is rejected, the Senate is somehow condoning sexual assault." But Flake, who earlier voted "yes" to advance Kavanaugh's nomination in key procedural motion, told reporters that he planned to vote to confirm Kavanaugh on Saturday unless something big changes. Murkowski, however, voted against the procedural motion to move forward. Later, she indicated that she would stick to her decision to vote "no" on Kavanaugh on Saturday. She told reporters Friday that it was "truly the most difficult evaluation of a decision that I've ever had to make." "I have been wrestling with whether or not this was about the qualifications of a good man or is this bigger than the nominee. And I believe we are dealing with issues right now that are bigger than a nominee," Murkowski said. "I believe that Brett Kavanaugh is a good man, I believe that he is a good man, it just may be that in my view, he's not the right man for the court at this time."